Last week MusicRadar told you that guitarist Aerosmith guitarist Brad Whitford, suffering a then-unspecified medical condition, would be missing the opening dates of the band's summer Guitar Hero tour with ZZ Top. Now Joe Perry reveals that Whitford suffered internal bleeding after smacking his head while getting out of his Ferrari roughly two weeks ago. In an interview with Reuters, Perry said, "It built up pressure and gave him this whoopin' headache. He's not prone to getting migraines, so he knew something was wrong. He went right in, they did what they had to do, and now he's getting better." 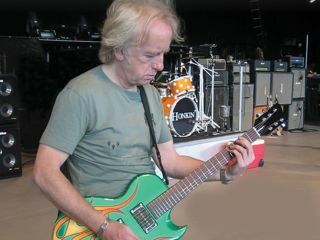 Because Whitford's injury required immediate surgery, the band scrambled and quickly recruited guitarist Bobby Schneck to replace Whitford while he recovers. Whitford's is looking at returning to the stage on 7 July when Aerosmith plays Raleigh, North Carolina, in which case the guitarist will have missed only 10 shows. In other news, it has now been revealed that Aerosmith will be playing their classic album Toys In The Attic in its entirety. They had been 'toying' with the idea of playing Rocks as well, but Attic, packed with hits such as Walk This Way and Sweet Emotion, won out.